Why use Point of Sale Systems? A POS software system doesn't just replace your cash register. All a cash register does is show your cash flow for the day. It can't provide any insight into profit, inventory or best selling products. A computerised cash register, on the other hand, can instantly tell you how much money you have left in your cash drawer, and how much of that money is profit. It can also tell you how many of a specific product were sold today, and how many you have left on the shelf. It can even warn you to order more items when stocks get low. By switching to a computerised point of sale system, an average small business (a company doing $500,000 per year in business) typically reduces theft by 2.5% - that's $12,500! How? Your employees watch inventory much more carefully, because they know that stock is being monitored. Everyone is more alert. A computerized system lets you watch for obsolete and broken inventory much more carefully. And you can have a much more accurate count with which to compare shelf inventory. These tools typically reduce shrinkage by another 2.5%. With detailed inventory reports, you can manage the flow of inventory much more carefully, ordering products when you see increased sales. You also build up historical data that can help you predict future inventory needs. You don't need 150 snow shovels in the summer, but you may need 500 more fans for your store during the month of August. Don't base your orders on what you think you sell. Base them on what you know you sell. By reading your reports you may find that you sell 10,000 batteries that cost 48 cents for 50 cents each and that you sell 100 flashlights that cost $1.98 for $9.95 each. Your inventory reports will help you to stock more products that give you greater profits and fewer products that give you the least amount of profit. Computerized point of sale systems, with barcode scanners and other helpful tools, make checkout much, much faster. That means happier customers. Even if you don't use a barcode scanner, a computerised system is faster, because you can enter SKUs that are automatically linked to pricing. With a computerised cash register, every item in your store has an associated price. Never again will you have to figure out how much that flashlight sells for. Your staff will stop guessing prices. Use POS software to store the name and address of your best customers. Then you can use the list to target advertising, or to just get on a first name basis with your most loyal consumers. 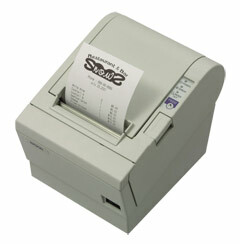 Axiohm Special Offer An Axiohm TM-T88 compatible Thermal Printer, POSBox Cash Drawer & Posiflex Scanner for $745 Inc GST. 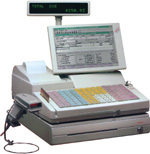 Low Cost PosiFLEX system Dot Matrix Printer, Cash Drawer and Bar Code Scanner from $665 IncGST.